As we leave the Circle and head around Olmstedian corners to North Delaplaine. We come to an impressive two story brick, center entrance with clay tile roof. 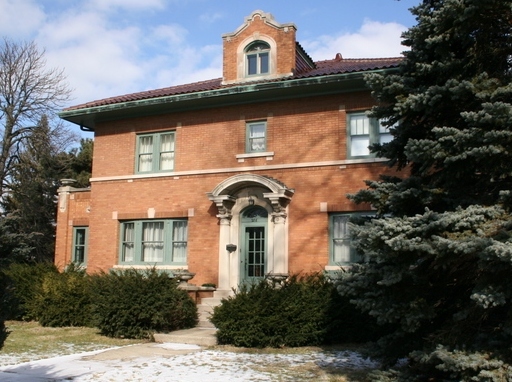 Built in 1925 for the president of the Berwyn National Bank ,it is important to our Housewalk because the heirs of the second owner of the house appealed to the Village to grant the home local landmark status to, hopefully, keep it from being torn down to make way for a McMansion. The chandelier collection is amazing. This home was built near the two lots Frederick Law Olmsted chose as partial payment for his work for the Riverside Improvement Company.